Abstract：With eleven different varieties of walnuts from four main production areas in Xinjiang as raw materials, the contents of water and crude fat in walnut kernels after shelling were analyzed, and the acid value, peroxide value and fatty acid composition of the pressed walnut oils were analyzed. 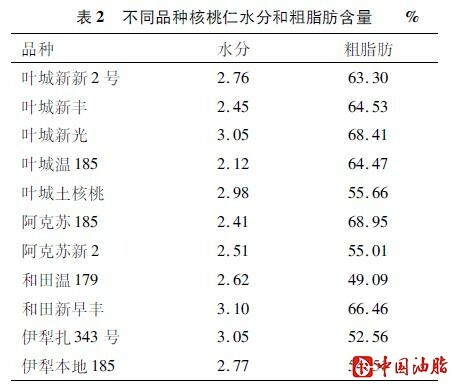 The results showed that the contents of crude fat and water in walnut kernels of eleven different varieties were 4909%-68.95% and 2.12%-3.10%, respectively. 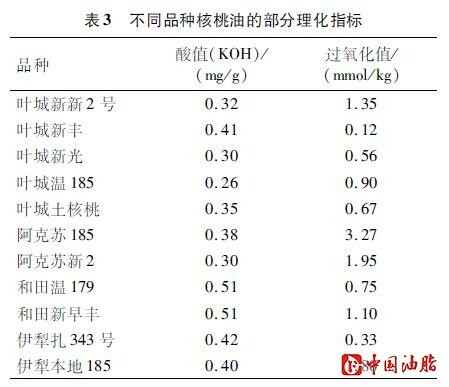 The acid value and peroxide value of pressed walnut oils were 0.26-0.51 mgKOH/g and 0.12-3.27 mmol/kg, all of which were within the range of quality indicators required by the national standard. The fatty acid composition in walnut oil was dominated by unsaturated fatty acids, in which the content of oleic acid was 14.42%-31.46%, the content of linoleic acid was 50.49%-62.78%, and the content of linolenic acid was 9.56%-14.69%. \[1\] 高海生, 朱凤妹, 李润丰. 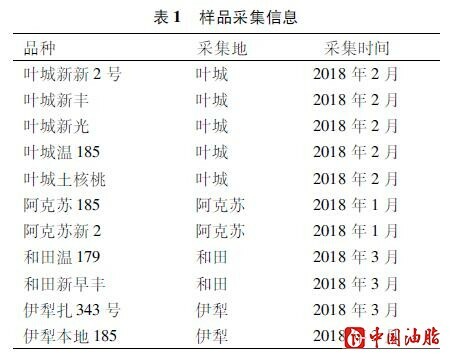 我国核桃加工产业的生产现状与发展趋势\[J\]. 经济林研究, 2008, 26(3):119-126. \[2\] 化婷, 刘丙花, 侯立群. 核桃种仁营养成分研究进展\[J\]. 山东林业科技, 2014(3):95-98. \[3\] 田津瑞. 核桃油提取及影响核桃仁贮藏品质因素的研究\[D\]. 太原：山西大学, 2015. \[4\] 朱振宝, 刘梦颖, 易建华, 等. 不同产地核桃油理化性质、脂肪酸组成及氧化稳定性比较研究\[J\]. 中国油脂, 2015, 40(3):87-90. \[5\] 陈炳卿. 营养与食品卫生学\[M\]. 北京:人民卫生出版社, 1995:20-35. \[6\] 刘力, 龚宁, 夏国华, 等. 山核桃种仁蛋白质及氨基酸成分含量的变异分析\[J\]. 林业科学研究, 2006, 19(3):376-378. \[7\] 郝艳宾, 王淑兰, 王克建, 等. 核桃油和核桃蛋白饮料系列产品工艺的研究\[J\]. 食品科学, 2003, 24(2):103-104. \[8\] 李煦. 核桃仁抗氧化、降血压作用及提取工艺研究\[D\]. 贵阳：贵州师范大学, 2015. \[9\] 杨春梅. 影响核桃仁中多酚类物质抗氧化活性因素的研究\[D\]. 呼和浩特：内蒙古农业大学, 2007. \[10\] 李桂花. 油料油脂检验与分析\[M\]. 北京:化学工业出版社, 2006:98-100. \[11\] 陈树俊, 田津瑞, 康俊杰, 等. 不同核桃贮藏前后油脂理化特性与脂肪酸气相色谱分析\[J\]. 食品工业科技, 2015, 36(8):324-327. \[12\] 冯春艳, 荣瑞芬, 历重先. 不同核桃品种脂肪酸的气相色谱分析比较\[J\]. 食品科学, 2009, 30(24):262-264. \[13\] LI J, LIU R J, CHANG G F, et al. A strategy for the highly efficient production of docosahexaenoic acid by Aurantiochytrium limacinum SR21 using glucose and glycerol as the mixed carbon sources\[J\]. Bioresour Technol, 2015, 177(2):2443-2450.